The What: AtlasIED has launched the new, compact ASP-MG2240 Amplified Sound Masking System. The What Else: The ASP-MG2240 is compact, taking up only 1 RU with half space: two ASP-MG2240s can be mounted side-by-side in a standard 19-inch equipment rack. Its feature set starts with two discrete amplified output channels for configuring two separate zone settings. 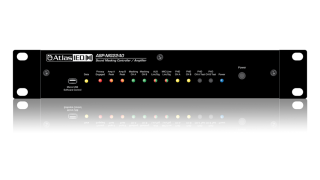 Each channel provides pink and white noise generator; 1/3 octave graphic equalizer for noise masking; line- or mic-level input with selectable phantom power; integrated mixer for noise generator, mic/line, and aux sources; feedback filter for mic/line source; daily time scheduler; separate five-band graphic and limiter for aux source; Class D amplifier technology; industry-proven masking presets; and computer setup with backup and restore. The ASP-MG2240 also incorporates two AtlasIED innovations. With Push Here Diagnostics (PHD), the ASP-MG2240 tests each output channels loudspeaker and cable wiring and automatically identifies any mismatches, shorts, or underpowered loudspeaker errors. It will report its status via the front LED indicators for each channel. With Privacy Engage Circuit (PEC), a LED visual sign and/or wall-mount trigger button can be connected to the ASP-MG2240. The trigger button can turn on or raise and lower the noise generator. It also lights up the LED visual sign. The Bottom Line: The ASP-MG2240 incorporates technologies for a professional-grade speech privacy system covering up to 7,500 square feet for applications such as business offices, call centers, counseling centers, medical offices, judicial offices, and conference and boardrooms.